Trendy Valentine's Day Nails – I Heart Hair, Inc.
A classic red nail is great for just about any day of the year, so try something new this Valentine's Day! Check out these super sweet polishes for February 14. Be creative and have fun! You could never go wrong with a classy red nail. It's timeless. Want to have a little more fun? 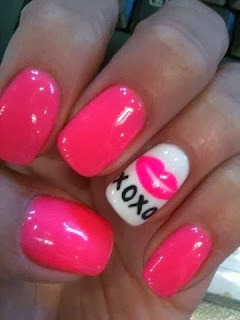 Go hot pink with a kiss! Don't want to do the typical red or pink? Switch it up, and do the Valentine's Day candy theme colors!